Last week, Little Caesars promised to give away pizza “if crazy happens.” Specifically, Little Caesars said it would offer customers free lunch combos if a No. 16 seed beat a No. 1 seed in the NCAA Division I men’s basketball tournament. It seemed like a fun and gimmicky way to get some attention on social media without any real risk. There have been No. 16 seeds in the tournament since 1985, and none of them have ever upset a No. 1 seed. Well, until Friday, that is. No. 16 seed UMBC (that’s the University of Maryland, Baltimore County, for everyone who still has no idea) crushed top-seeded Virginia 74-54. It was the maddest thing that’s ever happened during March Madness, and Little Caesars is following through on its promise. On April 2, the day of the NCAA championship game, Little Caesars is giving away lunch combos (normally $5) with a four-slice pepperoni pizza and a Pepsi beverage in all 50 states and Washington D.C. The promotion is only valid between 11:30 a.m. and 1 p.m. or until supplies last that Monday, and your order must be placed by 1 p.m. If you’re still in line at 1 p.m., there’s no free lunch. Also, this is limited to one combo per family. The thing about winning the lottery is that you did nothing to deserve it, and the most important thing is cashing in your ticket. This is how we feel you should react to this offer of free pizza. Go get it. In a way, this is crazier than winning the lottery. You are literally getting the chance to eat free pizza (and pizza that’s known as and trademarked as "DEEP!DEEP! Dish pizza") because something happened that had never happened before. Let’s consider the mathematical improbability of UMBC’s victory. 1. 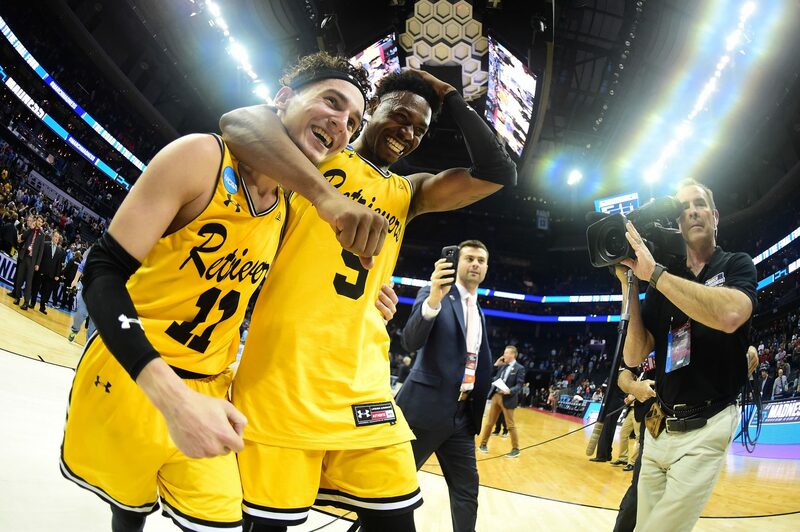 UMBC was more than a 20-point underdog. They weren’t just supposed to lose. They were supposed to be destroyed by Virginia. 3. If you had made a money-line bet on UMBC to beat Virginia at a Las Vegas sportsbook, you could have gotten 20-to-1 odds. Even if you don’t understand how this kind of betting works, it’s a simple thing to follow: An $800 bet on UMBC beating Virginia won a group of friends $16,000. The improbable payout happened at the sportsbook for The Venetian and The Palazzo, but at least the Vegas property can take solace in the fact that 2011 Food & Wine Best New Chef Ricardo Zarate just opened his excellent new Once restaurant in its Grand Canal Shoppes. 4. For long-shot bets like this, sportsbooks create odds that are very much in their favor, which means that the experts in Vegas were confident that Virginia was more than a 95 percent favorite to win. 5. Again, for the free pizza to happen, a team was required to pull off the biggest upset in NCAA tournament history. The only bigger upset that could have happened last week (and of course it didn’t happen) would have been a stunting Donald Glover beating Michael Vick in that footrace on Atlanta. Unfortunately for the UMBC Retrievers, they lost to Kansas State on Sunday. But they can hold their heads high knowing that they pulled off the most remarkable of upsets. They can enjoy the free shoes and swag that Steph Curry gifted them after their ridiculously improbable feat. And they can wake up on April 2 and go stand in line for some free pizza. Actually, hold up, can somebody at Little Caesars give these guys a line pass?